What better way to kick-off 2010 than a "Day One" trash patrol that nets only one piece of trash! Of course, ice and snow were abundant and the SuAsCo rivers were iced over at points. The opening photo shows the Assabet at Egg Rock and there is snow covered ice as far as I could see towards the Leaning Hemlocks. I had launched into the lower Sudbury River near this point and was not very optimistic after seeing the Assabet. However, the Concord River was open to the north so I headed downriver in that direction. 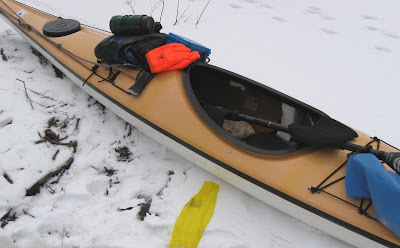 Before describing today’s trash patrol, I feel it necessary to mention the subject of cold weather paddling. As a rule, I avoid discussion of paddling gear/attire as these topics are very subjective and often become contentious. What might work well for one paddler would not suffice for another. I do, however, feel it would be irresponsible of me not to acknowledge the inherent risk of hypothermia and the precautions which I employ to prevent it. When I am on the river at this time of the year, I am dressed suitably for full immersion into cold water. In my case, that entails wearing a wetsuit, carrying an extra paddle, having a long painter attached to my boat’s bow, a small camp axe, and having a full set of warm clothing in a dry bag which I could change into immediately upon exiting the water. Of course, a life jacket is always worn by this paddler and a cell phone is at hand. The open water ended, however, about 100 yards beyond the cabin and that became my first turnaround point of the day. The trip back upriver was a warm one thanks to the effort expended to overcome the river's current. Once back at Egg Rock, I decided to see how far upstream the Sudbury River would be open. I passed Nashawtuc Rd, Elm St., the South Bridge, and Route 2 before finally reaching the end of open water between Clamshell Bank and Heath's Bridge (Sudbury Rd.). After enjoying a "mug-up" of hot cocoa, I turned around and began my trip downstream to my takeout location near Egg Rock. On the way I thought about what the new year may have in store. It will be the third year for this blog. How about booking passage for passengers in 2010? Well, sort of! Actually, I plan to book passage for books in the upcoming year by adding a “book packet” service to select trash patrols. By that I mean to transport particular books in “small packets” in or on my patrol vessel as they accompany me during a SuAsCo trash patrol. My kayak will thus be serving both as trash patrol vessel and "packet boat". Instead of handling packets of mail, however, I'll be handling packets of books. Once these books complete their river passage and are back on land, they will resume their journey to either my bookshelf or perhaps the bookshelf of a reader of this blog. The first books that have booked passage are: A Week on the Concord & Merrimack by Henry David Thoreau, Mosses from an Old Manse by Nathaniel Hawthorne, and The Concord Sudbury & Assabet Rivers by Ron McAdow. Is there a book that you would like to book passage for? If so, please contact me and let me know the book and if there is a particular stretch of SuAsCo waters you’d like your book to experience. For a nominal fee I'll purchase it, provide it river passage, and then mail it along to you. This service will commence with the arrival of spring. There are also plans in the works to provide passage for several automobile tires that presently reside in the Sudbury River near the Allen H. Morgan Avian Study Area. My YTD total stands at 1. Additional photos from today's wintry looking patrol can be seen at this link. I was researching the tufted duck that was recently sighted on the Sudbury River and discovered your delightful web site. Does Trash Paddler have a Facebook link? Hello Ingrid, Thanks for dropping by and glad to hear that the tufted duck is back again this year. One was seen early last spring on the Sudbury River behind Nashawtuc Country Club in Concord. Trash Paddler doesn't have a Facebook link preferring instead to either be out on the water or here, in my web cave.